Job announcement for a doctoral student in the REECR project now published! The length of the appointment is 3-4 years, beginning on 1.1.2014 at the latest. The appointed doctoral student will be situated at the Faculty of Theology, and will enter into an employment relationship with the University of Helsinki. The dissertation project will be carried out as part of the collective research project “Ritual and the Emergence of Early Christian Religion: A Socio-Cognitive Analysis (REECR),” funded by the Academy of Finland and directed by Risto Uro. The doctoral student will be part of an interdisciplinary team, consisting of a director of research (Risto Uro), who will also serve as the doctoral student’s supervisor, and of postdoctoral researchers, along with an international group of external advisors and collaborators. The project’s working language is English. In addition to completing the dissertation work, the doctoral student will contribute to some extent to teaching and other academic activities, as determined by the Faculty. The appointee should hold a Master’s degree in Theology, Religious Studies or a related field (or the degree will be completed by December 2013 at the latest), and should show competence in studying the New Testament and early Christian sources. The applicant should propose a dissertation project related to the theme and methodology of the REECR research project, and should be prepared to adapt it according to the aims and objectives of the REECR project and to the allocation of work in the research team. To successfully attend to the duties of the position, the appointee should have good English skills. THE TALMUD BLOG: “What does the Talmud Have to Offer Israeli Culture?” Yair Lipshitz and Moulie Vidas in Conversation on the Value of Talmud Study, the Beginnings of Talmudic Culture, and the Talmud’s Role in Israeli Society. ADAM MCCOLLUM: A Syriac fragment on Job and his wife: Text and translation. HAPPY BIRTHDAY TO ME! I'm taking the day off and going to Edinburgh, but I'll leave you a couple of things before I go. Had Antony not lost the battle of Actium in 31 BCE, there might have been a dramatic change in the history of the Western civilization, [Prof. Rami] Arav says. I thought the West was worshipping cats today, at least judging from the Internet. And as for pyramids in Paris, the headline writer needs to visit the Louvre, or at least rent a DVD of The Da Vinci Code. OBITUARY FOR SEAN FREYNE IN THE IRISH TIMES: Eminent theologian Seán Freyne dies. There is, then, a great gulf of time and space, a historical rupture, inscribed within the Talmud itself. The Amoraim are often reduced to guesswork when they try to figure out the Mishnah’s exact meaning and, still more often, its exact authorship. They are constantly asking which Tanna held which opinion, and why, and how you can tell. Frequently, they have to deduce what a given Tanna thought by analogy: If he said X regarding one subject, he must have said Y regarding another. At least as much energy is devoted to these questions as to the substance of the laws themselves. Sometimes, as we saw in the Daf Yomi reading this week, the loss of knowledge is still more profound, when the very meanings of words used in the Mishnah are forgotten. In Pesachim 39a, for instance, the Mishnah lists the species of vegetables that can be used to make maror, the bitter herbs eaten on Passover: chazeret, tamcha, charchavina, ulshin. But these names conveyed nothing to the Aramaic-speaking rabbis of the Gemara, who had to translate them into their own language: chasa, hindvei, tamachta. And the chain of translation doesn’t end there. Over the next 500 years, the meaning of these plant names was lost again, and so Rashi, commenting on the Talmud in the 11th century, had to try to figure out their French equivalents: hindvei, in old French, was krespelah. And in the last thousand years, krespelah itself was forgotten, so now we English-speakers have to guess at what Rashi was talking about. According to the Schottenstein Talmud, it is probably what we call endive, or possibly escarole. Philologists today spend their time trying to understand the meaning of ancient texts like the Talmud, the meaning of whose vocabulary and grammar has often been forgotten over the centuries. And on a somewhat related note: Reading the Talmud in the Tower of London (Stephen Grosby, Library of Law and Liberty; via Jacob L. Wright on Facebook). On March 4, 1629, John Selden, the most learned man in England, was imprisoned in the Tower of London. He had been arrested on charges of conspiracy and sedition against King Charles I. The question is: what did Selden choose to read while imprisoned? You have to read for a while to reach the answer, but it's there already in the title. The question can no longer be put off. What did Selden study while imprisoned in the Tower of London? The answer to our question is: the Babylonian Talmud. Basically the answer is for New Testament background. Now Professor Grosby at this point gives the somewhat misleading impression that New Testament scholars still draw on the Talmud for NT background. In fact, they stay away from (or at least they should stay away from) the Gemara, which consists mostly of traditions attributed to the much later Amoraim. The Mishnah consists of traditions attributed to the Tannaim, who lived from the first to the third centuries CE. 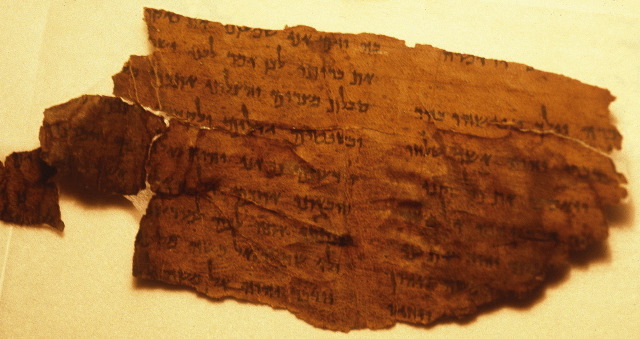 The earliest layers of this material are potentially relevant to the New Testament, but great care must be taken to establish the date of these traditions not only on the basis of attribution to the earlier rabbis (which is unreliable), but also on the basis of the stratigraphic relationship with older traditions in the Mishnah. It's complicated. All that said, I can totally relate to Selden. I hope I never end up locked in the Tower of London, but in the unlikely event that I do, I will probably take similar reading material with me. But there’s a handful of fragments that Israel doesn’t have. The source is William Kando, whose father, Khalil, a Palestinian Christian, became the main dealer of Dead Sea Scrolls after Bedouin Arabs first found them in the late 1940s. But he held onto one important scroll. In 1967, Israel detained William’s father, and he confessed he’d hidden it: the longest Dead Sea Scroll ever discovered. “My father (kept) it at home, in a very good condition,” Kando said. It was stored in a shoe box under a floor tile in his bedroom. Israel bought the scroll from him. But he had more scroll fragments hidden throughout the house. Kando says his father put them in a safe deposit box in Switzerland. When Kando’s father died in 1993, his children inherited the collection. Very quietly, they began to sell. Lots of background here. Also Loren Stuckenbruck tells me that there is an Aramaic manuscript of the Book of the Watchers (1 Enoch 1-36) currently in Switzerland (I don't know if it is one of Kando's), the asking price for which is I-don't-remember-how-many-million dollars. I also don't know if the latter has any connection with the 1 Enoch manuscript mentioned in this post. SAD NEWS: I hear from Benjamin Wold on Facebook that Professor Sean Freyne died yesterday. He taught at the School of Religions and Theology, University of Dublin, Trinity College, and was known particularly for his research on the ancient Galilee and on the Historical Jesus. Requiescat in pace. UPDATE: Larry Hurtado has more here. Secunda unites the fields of Talmudic scholarship with Old Iranian studies to enable a fresh look at the heterogeneous religious and ethnic communities of pre-Islamic Iran. He analyzes the intercultural dynamics between the Jews and their Persian Zoroastrian neighbors, exploring the complex processes and modes of discourse through which these groups came into contact and considering the ways in which rabbis and Zoroastrian priests perceived one another. Placing the Bavli and examples of Middle Persian literature side by side, the Zoroastrian traces in the former and the discursive and Talmudic qualities of the latter become evident. The Iranian Talmud introduces a substantial and essential shift in the field, setting the stage for further Irano-Talmudic research. Shai Secunda is a scholar at the Martin Buber Society of Fellows at the Hebrew University of Jerusalem and coeditor of Shoshannat Yaakov: Jewish and Iranian Studies in Honor of Yaakov Elman (with Steven Fine). The book also has a website here. NEWS YOU CAN USE: Announcing the Septuagint Studies Soirée. The triennial meeting of the International Organization for the Study of the Old Testament is happening right now in Munich (4-9 August). A meeting of The International Organization for Septuagint and Cognate Studies took place in Munich on 1-3 August, where the meeting of the International Organization of Targumic Studies is also about to start. Nijay Gupta: The Importance of the Septuagint (Even for Pastors…) Part 1 and The Importance of the Septuagint (The Apocrypha) Part II. Also, Deissmann’s Passion for the Septuagint! I've been following the story, but haven't had time until now to post on it. Briefly, Professor Aslan has published a book on the Historical Jesus. Ms. Green handles the interview badly by belaboring the fact that he is a Muslim and wondering why a Muslim should have any interest in Jesus. Professor Aslan gets the better of the interview overall, but he in turn embarrassingly belabors his own credentials (if you need to mention more than once that you have a Ph.D., you've lost the frame) and makes claims about their relevance to the subject matter of the book which have not gone undisputed. I have not read the book, but such reviews as I have seen indicate that it says nothing new or particularly interesting, covering well-traveled ground and reaching conclusions that are somewhere between debatable and outdated. To be fair, it is exceedingly difficult these days to write a book about the Historical Jesus which doesn't share these flaws. The ground is simply too well covered by experts already and our very limited sources simply cannot tell us much more about Jesus than they already have. Here are links to reviews by novelist Naomi Alderman in The Forward: Separating Jesus the Man From the Myth and by (well-known to PaleoJudaica) literary critic Adam Kirsch: Jesus Was a Rebel and a Bandit. What Made Him Also the Christian Son of God? Aldeman's evaluation is very positive and Kirsch's positive but with qualifications. Of special interest are reviews by two biblical scholars: Greg Carey: Reza Aslan on Jesus: A Biblical Scholar Responds; and Anthony LeDonne: A Usually Happy Fellow Reviews Aslan’s Zealot – Le Donne. Both are highly critical and Le Donne's is brutal. What Prothero says about his expertise in NT Studies still stands. I have now read the book and I can say (without question) that Zealot is not written by an author conversant with the field of NT studies or Second Temple Judaism more generally. More on this point in the coming days. As to the credentials issue, where Aslan might be in the biggest danger of falsehood is in his claim to be a teacher of religious studies, or that he does this "for a living". He is not a religious studies instructor in the traditional sense of that title. A colleague of his from Riverside has confirmed this for me. No doubt, he overplayed his credentials, but there is a difference between setting the record right and tearing a colleague to shreds. Buzzfeed also collects some of Professor Aslan's more acerbic tweets: Author Attacked By Fox News Is Actually Kind Of A Jerk On Twitter (strong language warning). I realize that the tweets are doubtless selected from a much larger output, but still. Call me old fashioned, but I think this kind of rhetoric fails to show scholarly dignity. But here's an interview with the Boston Globe in which he speaks in a more scholarly mode. There is much more in the blogosphere about the whole episode and about Professor Aslan's book. Returning to the issue that started the whole episode, I can say with confidence that having Muslim scholars do original work in New Testament studies is something most New Testament specialists would welcome. There was a time in the early 90s when it was PC to think that only those "within the tradition" should publish scholarly work in any given area of religious studies. I thought then and still think that this idea is unhelpful and corrosive. Muslim scholars should publish on Christianity, Christian scholars on Judaism, and Jewish scholars on Islam. And fill in all the rest of the permutations. And, of course, add agnostics, atheists, etc. In the first place, we as historians and historians of religion are all following the same scholarly approach, which at least aims for objectivity in its results, so there is scope for considerable agreement. In the second place, scholars coming out of different religious traditions will start with somewhat different assumptions, interests, and focuses, and are likely to see avenues worth following up which those "within the tradition" or from other traditions might miss, even though the latter would recognize the importance of those avenues once pointed out. If this little episode causes us to think in a constructive way about what we are doing as scholars and how each of us can contribute, some good will have come of it. UPDATE: The story has now found its way into the New York Times: Return of the Jesus Wars (Ross Douthat). By profession, Mr. Aslan is not a scholar of ancient Judaism or Christianity. He teaches creative writing. And he is a good writer. “Zealot” is not innovative or original scholarship, but it makes an entertaining read. It is also a serious presentation of one plausible portrait of the life of Jesus of Nazareth. UPDATE: Another review, by Charlotte Allen in the L.A. Times: Reza Aslan's 'new' take on Jesus: The controversy over his book about Jesus' life misses the point. EXCAVATION: Samford Archaeological Dig in Israel uncovers Jewish village (Greg Garrison, Al.com). The remains include an ancient synagogue, houses and massive evidence of pottery production in the ancient Jewish village of Shikhin, near the ancient Jewish city of Sepphoris (Zippori). The site is important because it teaches about Galilean Jewish village life and its economy at the birth of both Christianity and the Judaism of the Talmud, according to [excavator] Dr. [James Riley] Strange. The sites are about five miles northwest of Nazareth. MORE ON MOSAICS IN ISRAEL: In bits and pieces: Mosaic splendor at Tzippori: From the Akeda to ‘Mona Lisa of the Galilee,’ the wine drinking contest of Heracles and Dionysus, and the angels telling Sarah and Abraham of their impending parenthod, Tzippori is a wealth of ancient art (Aviva and Shmuel Bar-Am, Times of Israel). Earlier posts on Tzippori/Zippori/Sepphoris are collected here. And there's lots more on mosaics in Israel here.